As we know that music makes us happy many of us not only like, but they love listening to music. In this modern age android smart phone has made it very easy to listening to the music anywhere anytime and in any mode. You can say your Android smart phone as a replacement for MP3 player, which provides you the facility to download on listen to the music online absolutely for free using any 3G or 4G network or Wi-Fi connection. So just connect to the internet and choose some music downloader app for free to enjoy the nonstop music anywhere anytime. Mostly people like to gather their favorite music so that they can listen anytime even the internet is not available. So just choose any free music downloader app for android and store your favorite songs to enjoy more. Are you worried to choose the free music downloader app for android? Is this issue making you confuse that which app is the best? We are here for your help! 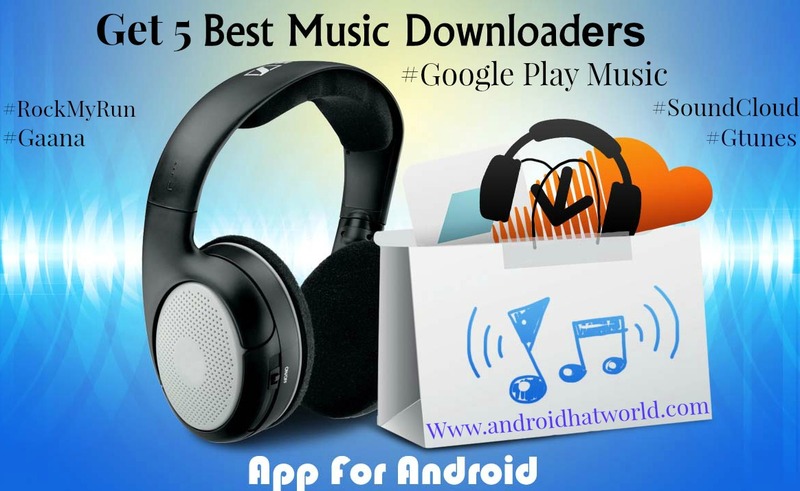 We are listing 5 best free music downloader apps for android you can choose anyone of your choice. Google Play Music is one of the superb free music downloader apps for android. This fantastic app has more than 50,000 songs available for free. Google Play Music has some extra features such as the smart recommendation that recommends you songs according to your own tastes by matching genres of songs. Install this app right now on your android smart phone and enjoy listening music of your choice. RockMyRun is the best workout music app try it if you are in search of workout music app. This fantastic app provides genres of workout music such as Bass, Drum, Rock, Hip Hop, Pop etc. This app improves your motivation level by 35% according to a survey. So what are you waiting for? Go ahead and try this app to increase your workout. Gaana is also the best music downloader app for android smart phone and tablet. Recently added download features of the app are just amazing. Gaana free music app provides you only Hindi songs. So if you are a lover of Hindi songs, it’s time for you to install this app on your android smart phone or tablet right now. A popular free music downloader app available for free and its paid version is also available to avoid ads you have to pay only a small fee for it. The SoundCloud app has millions of users and its average rating is 4.4. Gtunes Music Downloader is the faster music downloader app for a nonstop music downloading. This marvelous app provides you millions of songs and the facility to direct download to your SD card. Gtunes, the fantastic app is available absolutely for free and this is the app that is free of ads as well. Install this app on your android smart phone or tablet to have a nonstop fun in your life. If you got any questions or any suggestions & thoughts & feedback then use the below comment box. I Will Always check comments and do reply to each one..Don't Forgot to Share and subscribe us..Thanks Dears!